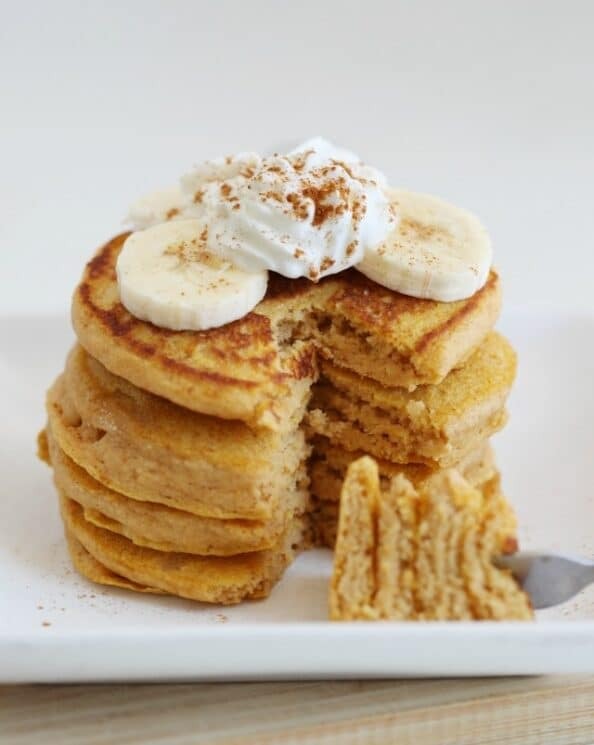 With leftover mashed sweet potatoes, boost your breakfast nutrition by making sweet potato pancakes! 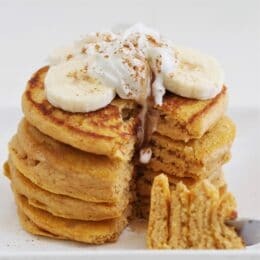 We’ve been eating sweet potato pancakes for as long as we have been eating sweet potatoes for dinner, and we can’t get enough! The kids love them, and they even got rave reviews by the pickiest eater in my neighborhood, and that’s saying something! The sweet potatoes we used for this recipe are commonly purchased in U.S. grocery stores under the names YAMS! We ARE using the orange fleshed potatoes for this. Every time we post about sweet potatoes, when we mean yams, we get lots of confusion. Potatoes come in a variety of forms. Our grocery store sells two varieties of sweet potatoes. 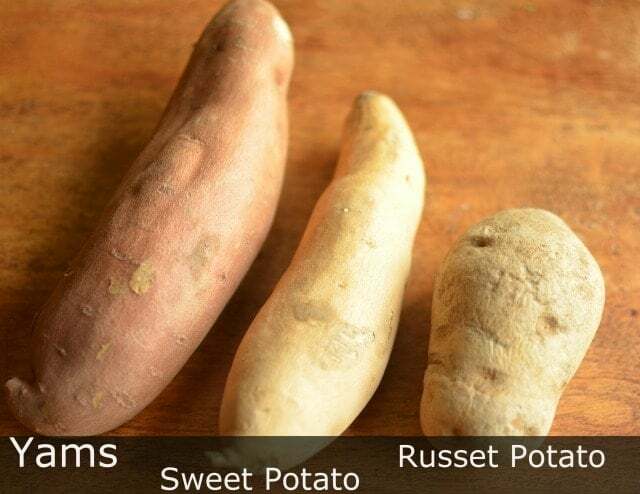 Although both veggies you are getting at a common grocery store are sweet potatoes, they call one a sweet potato, and the other a yam to distinguish them from each other for the consumer (you!). 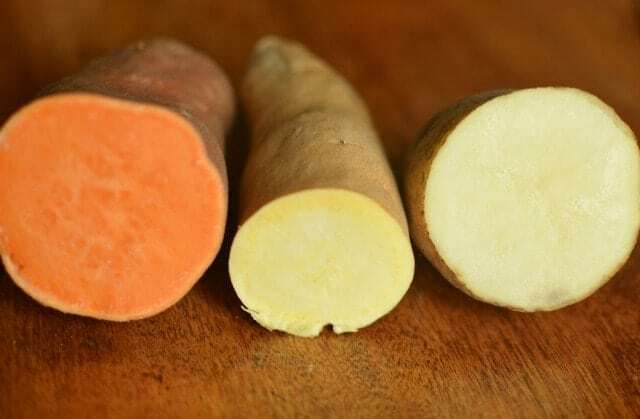 Botanically, the orange fleshed potato sold in grocery stores (called a yam), isn’t a yam at all (veggie nerds can see the full discussion on that here), but it does help to keep them separate for us common folk! I will say, you should know the difference, because it is important if you’ve started ordering your groceries online or for pick up! Choosing a sweet potato, I’ve gotten the white fleshed sweet potatoes on more than one occasion! SWEET POTATOES: (with white flesh) We use this potato less often. It’s looks similar to a russet potato, and is not as sweet as the orange fleshed “yams”. YAMS: (with orange flesh) This is the potato we use most often. We love the flavor, the versatility, and the ability to add it to so many different recipes! Canned yams have become popular as a Thanksgiving side dish in the United States, and as a result, a lot of kids decide they don’t like yams before they ever have the chance to try them fresh. Canned yams are generally packed in syrup, and are much too sweet for a side dish (in my opinion). Then, it’s often cooked with marshmallows or more syrup. The texture is often hard to handle for kids; it’s very mushy and falls apart easily. and of course, in pancakes like these! Is one healthier than the other? YES! Yams, with their rich orange color, has more vitamins. The more colorful your fruits or vegetables are, the more nutrients they have. So, why do we like to add mashed sweet potatoes to our pancakes? Sweet Potatoes are a great source of Vitamin A! In one sweet potato, depending on the size and where it came from, you may get 35-90% of your daily recommended value of Vitamin A.
Mashed sweet potatoes are very moist and is a great base for baked goods. 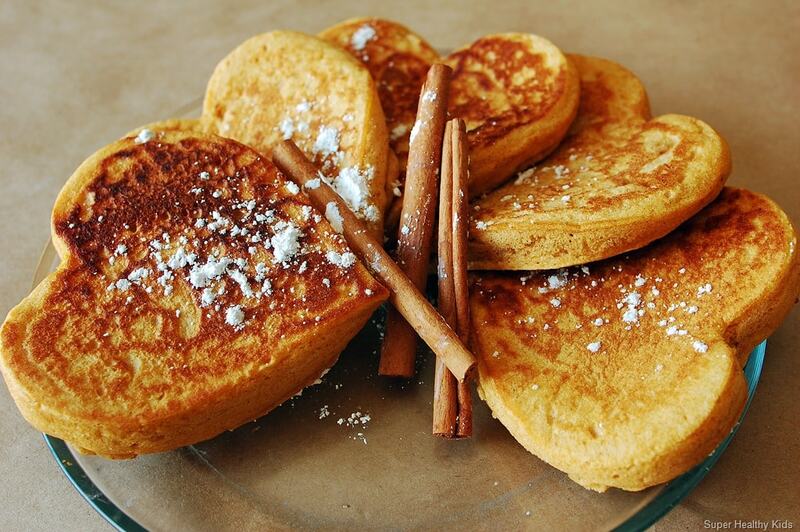 Sweet potatoes give pancakes a nice sweet flavor without having to add refined sugars. 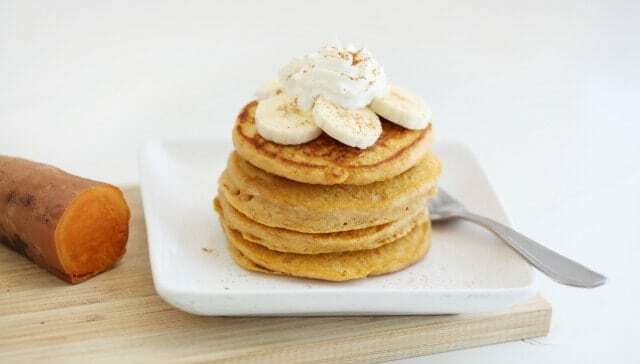 The best part about sweet potato pancakes is that you can add even more nutrients and fiber to your breakfast by topping it with fresh fruit! We like bananas, berries, plums, or peaches. With fruit and sweet potatoes, we often don’t even need syrup. A little bit of creamy yogurt or whipped cream can turn a boring pancake breakfast into one of our favorite desserts! So, don’t delay! Have some sweet potatoes for dinner, so you can have some leftovers for breakfast! If you love sweet potatoes, check out our sweet potatoes in the slow cooker! If you love pancakes, you must see the 23 pancake recipes we just love! Tell us in the comments, what is your favorite way to eat sweet potatoes? Cook sweet potato (this can be done the night before). You will need 1/2 cup mashed. Blend first five ingredients in a blender, until smooth. Whisk together the flour, baking powder and salt. Add the sweet potato mixture and stir just until combined. Add more milk if needed for the consistency of pancake batter. Pour the batter onto a hot griddle greased with nonstick cooking spray. Flip the pancakes when the begin to bubble and are golden brown on both sides. Serve warm topped with sliced bananas, yogurt, and a drizzle of maple syrup. Hi, For the Yam Pancake recipe, is it really a yam you used or a sweet potato? I know that those 2 terms are usually used interchangeably but they are two very different vegetables and I wanted to make sure that I was using the right one. Hi Zeena, I understand sweet potatoes to be the broad term with yams being a type of sweet potato. So for this recipe I’m referring to yams. Thanks! How fun and healthy too! I know my kids would love these. You always have amazing and new ideas with food. How cool and yummy they look. Thank you Amy! My picky little eaters loved them. Thanks! My son is allergic to cow’s milk protein and also has a mild allergy to soy. Will rice milk be a good substitute for cow’s milk? I love all your pancake recipes!! Pancakes are one way we get a lot of good grains in us throughout the week! Would the batter work to prepare ahead of time? These look awesome! You could definitely make the batter ahead of time, and then store it in the fridge. Give it a good mixing before you make the pancakes. Yam, usually, is not even sweet. And if it comes to vitamin A – one yam, like the one on my kitchen table right now – is definitely too much for a family of four. It has more than 1/2 meter in length. Can I substitute rice dream vanilla for the milk and how much applesauce for the egg? how dod you cook your yam? Alos, you said: you used leftover yam from dinner (you can leave these in the flesh, and put them in the fridge. – but when you said you leave the yam in the flesh, what do you mean? Hi Joy- I mean the skin! I didn’t word that properly at all. I leave the potato in the skin, and scoop the flesh out the next day! Joy- I cooked it in the oven, like a baked potato. But you can really cook it any way you want. You just need that soft flesh to make the pancakes. Okay, thanks. We used some cooked yams that were previously boiled. maybe I will try them roasted next time. maybe the variety of yam we used was not very special, but I added some fresh hot pepper, thyme and rosemary to try to spice things up a bit. perhaps we just have a taste for spicier foods, as most Caribbean people do. And mine didn’t look like yours either!!! I noticed the last one to be done rose a bit better than the very first two. How many pancakes does this recipe make approximately? Thanks! would these still be good if I made extra and froze them? About 6 if they are as big as the ones you make in the pancake heart shape. I haven’t tried it Glendeen, but I”m sure they would be fine, just like other pancakes. Can i sub the milk for soy or almond milk? Absolutely Jennie- we do it all the time! Tried to make this morning and my batter was more like dough? Added more and more milk and nothing…. What did I do wrong? Adding more milk didn’t help? Did you blend the first few ingredients till it was smooth? In a blender? @natasha? I sure did! I added additional milk in increments to try and get a liquid consistency but ended up with fluff. Blended all ingredients and added to the dry. The only thing I can think of was I used coconut flour instead of whole wheat. Can’t imagine that would make a difference. I was totally bummed since I saved some sweet potato from my sweet potato tots to try this recipe for my little one. 🙁 oh well, thanks for the recipes! We’ve made these twice now, with special-edition pumpin spice almond milk and a flax egg. I, too, like the batter runny so added lots of additional unsweeted almond milk at the end. Each time, no matter how thin we made them, the inside was rather doughy. We found that letting them cool, than popping them back on the griddle for a few minutes, helped to make them more like regular pancakes. Mmmm – for someone new to vegan/oil-free eating, this was a keeper, with tweaks. Thanks for the help Casey! These are a hard one to get right. Made these last night and they are delicious!! I love that there is no added sugar. I know somebody who makes west potato pancakes (diferente recipe) and freezes left overs after the first day, and then throws them in the toaster for the rest of the week. I’ll be trying that because I made a double batch! Will this suit a 10 month old? Considering the baby is under 12 months, you may want to check with your pediatrician. If there is an egg allergy in your family, it may be of concern. We do not have an egg allergy, but I still opted to omit eggs from my kids diet until after the age of one. If indeed you choose this option, you may use an egg substitute. Mix 1 tablespoon of flax meal with 3 tablespoons of water and allow to sit for 5 minutes. This will work for 1 whole egg replacement. Not bad, but not that great either. Super yummy but a bit thick. Also sweet potato quantity needs to be in grams as the sizes vary hugely! Granted, I made these with my go-to gf flour pancake mix, but they were overly moist and gummy. Flavor was ok. These are fantastic, we loved that there was no added sugar. So good. 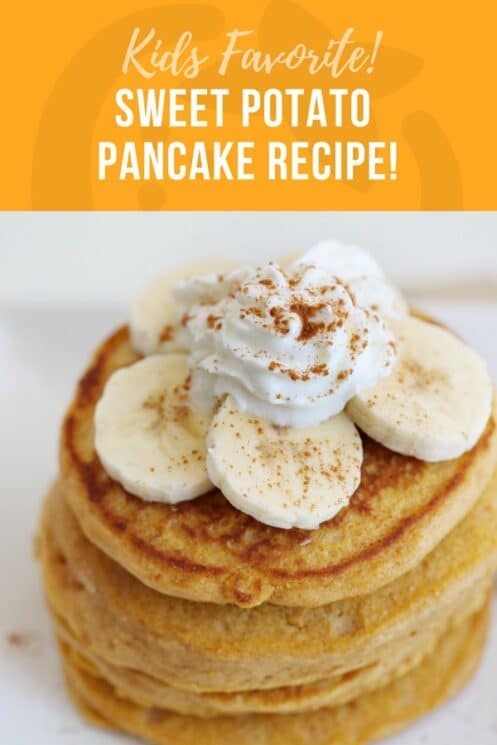 They are one of our favorite pancake recipes! Thank you so much for this recipe!! My 11-month old loves them. Quick & easy to whip up, and it’ll be nice to have them on-hand for busy mornings. It looks like a work of art.That is so cool and I love it inside and out ? ?‍♀️?.